Description: High-speed 750-881 ETHERNET 2.0 Programmable Fieldbus Controller processes 1000 instructions/235 microsecs, and provides significant amounts of memory for PLC programs and Web applications. 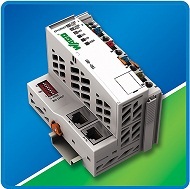 Specifications: Standard CoDeSys V2 programming environment is IEC 61131 compatible; Supports up to 250 I/O modules; Slotted housing optimizes heat dissipation while maintaining a 0°C to +55°C operating temperature range and IP20 rating. Certifications include UL 508, cUL, GL and CE.